Kristine Carlson got the news about her husband in a way that no one should have to. With the utterance of six words, her world changed completely. “Mrs. Carlson, your husband has expired.” At 45, her husband, Dr. Richard Carlson, and co-author of Don’t Sweat the Small Stuff… and it’s all Small Stuff series, had passed away from a pulmonary embolism. Kristine continues her husband’s legacy of peaceful and mindful living through her own bestselling books, Don’t Sweat the Small Stuff in Love, Don’t Sweat the Small Stuff for Women, Don’t Sweat the Small Stuff for Moms, An Hour to Live, an Hour to Love: The True Story of the Best Gift Ever, and Heartbroken-Open: A Memoir Through Loss to Self Discovery—as well as her well-known “What Now?” program and her upcoming “Don’t Sweat” E-course. In addition to sharing her message of empowerment, success, emotional strength and love through her books and programs, Kristine is also a world-renowned speaker. She has appeared on the Oprah Winfrey show, The Today Show, Good Morning America, The View, CBS in San Francisco, and other local news and talk shows. In 2010, Kristine was honored with the Kennedy Laureate Award, by John F. Kennedy University. This acknowledgment was also given to Alice Waters and Dr. Sanjay Gupta for their work in the area of mental, physical, spiritual health and well being. She has served on the Board of Directors and the Global Leadership Council for Challenge Day and was honored to join the Women Go Red campaign for the American Heart Association in 2012 as their keynote speaker. Kristine lives in California and is mom to two daughters and “Nana” to three grandchildren. 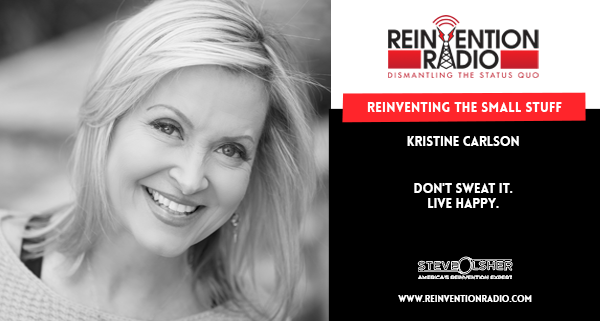 TUNE IN to this episode as Kristine chats with Steve, Mary and Richard about reinventing the small stuff, how not to sweat it and live happy. Reinventing Your Health – In this episode, JJ Virgin chats with Steve, Mary, and Richard about reinventing your health and understanding that your body is not a bank account – it’s a chemistry lab.